It's not that no new insects have evolved. Rather, as new insects have evolved, others have gone extinct, leaving the overall diversity relatively unchanged, according to paleontologist Matthew Clapham, associate professor of Earth and planetary sciences at UC Santa Cruz, whose team published the new findings February 3 in Proceedings of the Royal Society B. Previous studies of how insect diversity has changed over time used methods that artificially inflate the relative richness of younger (more recent) time intervals, Clapham said. These studies, as well as Clapham's, looked at the richness of the fossil record with respect to insect families, a broader taxonomic category than species and genus. The earlier studies were based on the first and last appearances of each family in the fossil record, and if there were still insects in that family living today its range was extended to the present. "The problem is that the range we see in the fossil record is always smaller than the real range, because insects don't fossilize very well--they don't have bones or shells," Clapham explained. "By extending the range of extant families to the present, you increase diversity toward the present day. It's a known bias called 'the pull of the recent.'" 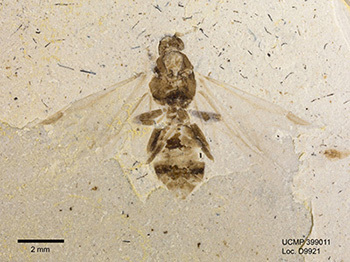 To avoid that bias, the researchers compiled a database with not only the first and last occurrences of each family, but essentially all available data on fossil insects. It took about three years and yielded a database of more than 39,000 insect fossil records representing about 25,000 species. Then they were able to use modern statistical methods to assess insect diversity over the past 325 million years. "What we found when we used less biased statistical methods is that the incredible diversity of insects is not just a recent phenomenon. They were extremely diverse in the past as well," Clapham said. 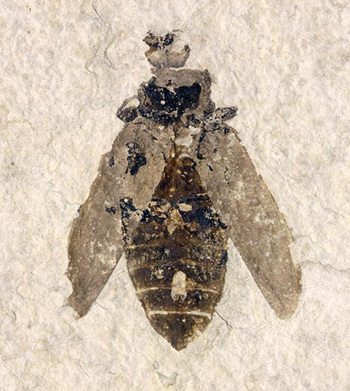 Insects first appear in the fossil record in the Devonian Period, about 400 million years ago, but they don't become abundant until the Carboniferous about 325 million years ago. Insect diversity peaked about 125 million years ago during the Cretaceous Period, and changes since then have been negligible, Clapham said. The early Cretaceous may be a period when older groups that have since declined overlapped with the diversification of newer groups. "It's clear that certain groups that are very diverse today have diversified a lot recently, but other groups were probably just as diverse in the past and have declined," Clapham said. "Instead of a constant increase in diversity, what we see more often is some groups diversifying and other groups declining, so it balances out," Clapham said. The study also looked at diversity at the species level and found similar trends, although the analysis is not as robust, he said. 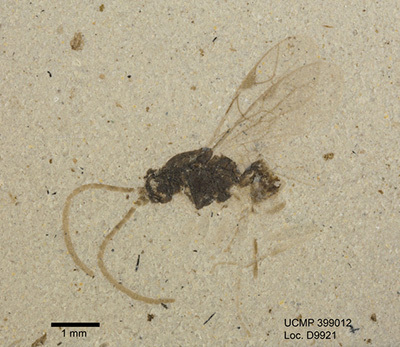 Factors that complicate species-level analysis include the spottiness of the fossil record and the fact that researchers are unlikely to publish the discovery of a fossil insect species that has already been described, even if it keeps showing up in different time periods. "It makes the statistical methods hard to apply at the species level, because the published papers are a nonrandom sampling of the actual fossils," Clapham said. "As long as we're consistent in what we call a family, however, it seems likely that the average number of species per family hasn't changed much through time." In addition to Clapham, the coauthors of the paper include UCSC graduate student Jered Karr; David Nicholson and Peter Mayhew at the University of York (U.K.); and Andrew Ross at the National Museum of Scotland. 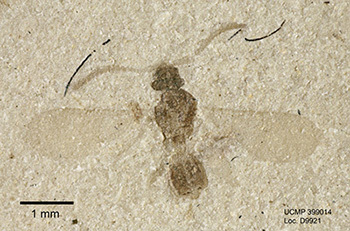 The database of insect fossils they compiled is available through the Paleobiology Database.